Albuquerque day trips can be as short or long as you like. These day trips from Albuquerque are about an hour or two drive from town, and range in content from historical looks into the past, a browse through small towns, a chance to see nature, or a nearby pueblo. Drive to Jemez Springs for hiking and dip a toe in the water, or in the winter, enjoy the snow. Or head into the small town of Madrid, where melodramas, art galleries, and a historic bar are just part of what you'll find. No matter what you're in the mood for, each of these day trips takes you to your destination in less than a few hours, and provide you with new ideas about New Mexico. New Mexico pueblos provide a rich glimpse into first cultures. Acoma Pueblo is called Sky City because it sits atop a mesa that is nearly 400 feet tall. Acoma is the oldest, continuously inhabited settlement in North America. It lies about 50 minutes west of Albuquerque, along I-40. Acoma's Sky City Cultural Center provides educational tours, a museum, activities, and exhibits about the pueblo. The Haak'u Museum showcases Acoma's culture and art. Jemez Springs is known for its hot springs, its hiking trails and the red rock walls that surround the area. The area is a great place to head to for the day, the weekend, or as long as you like. The small town of Jemez Springs has shops, galleries, and restaurants. The natural beauty of the area draws visitors as well as locals. Coming west from Albuquerque along Highway 550, turn north at San Ysidro. At a relaxed pace, it takes about an hour and a half to arrive from Albuquerque. The Salinas mission is one of three that are in the area, and it's easy to visit all in one day, or take a more leisurely pace and focus on one. The Quarai, Abo and Gran Quivira ruins are all run by the National Park Service. The thriving American Indian communities that once lived in the area were visited by Franciscan missionaries in the 17th century. Today, the ruins continue to tell their story. To get to Salinas, take I-25 south from Albuquerque to Belen. Take 47 to US 60, then head east to Mountainair. Or take I-40 east to NM 337 and drive south to Mountainair. Madrid was once a mining town, and its small cottages continue to be used today as art galleries, homes, and restaurants. Madrid is an artist's enclave and on the high road to Santa Fe. Spend the day in town, or visit it on the way to the state's capital. While in Madrid, it's fun to tour the Coal Mine Museum, see a melodrama and visit the Mine Shaft Tavern. There's likely to be something on the calendar any time of the year. Madrid is a fun visit with the family for a few hours or a great place to stay the night. To get to Madrid, take I-40 east from Albuquerque, and take the road north at Tijeras. Route 14 goes through Madrid and on to Santa Fe. The Valles Caldera is a 13-mile wide volcanic caldera in the Jemez Mountains. 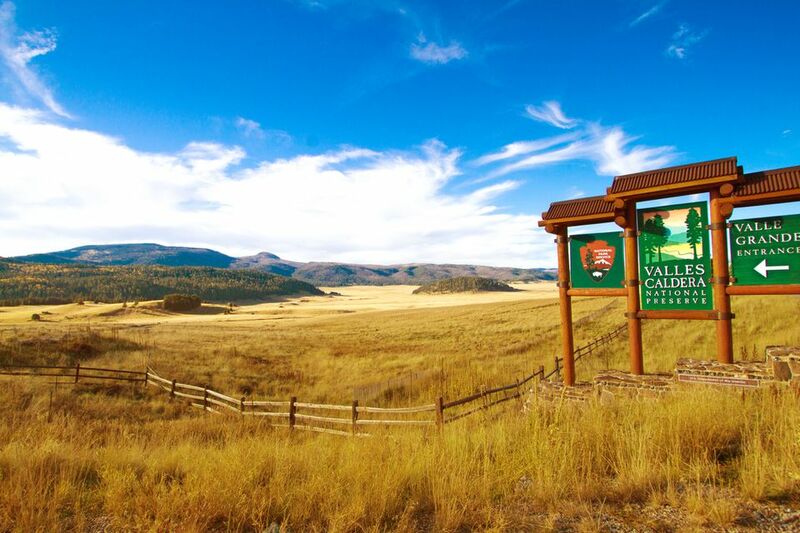 Around the caldera is over 900,000 acres of natural preserve and offers recreation opportunities all year round. Hiking trails, snowshoeing, fly fishing, and cross-country skiing, are just a few of the activities possible. The preserve is good for bird watching or as a stop on the way to Los Alamos for the day.